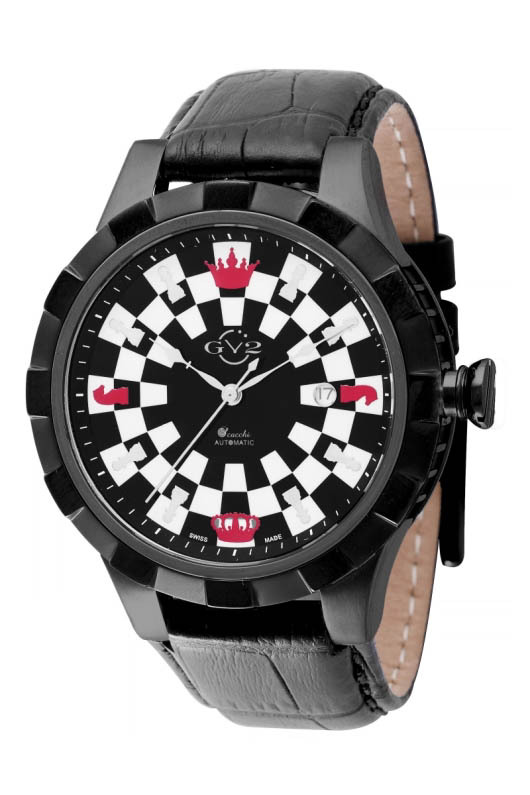 The GV2 Tavolato is a men’s collection of chess-themed watches — tavolato is an Italian word for chess. Each Tavolato watch features a substantial 46 mm case made from stainless steel. The caseback boasts a round checkerboard engraved pattern as well as a small aperture to glimpse the movement’s winding rotor. 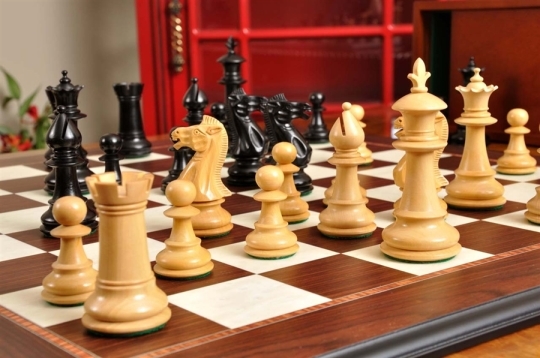 The sides of the case are fluted, as is the head of the crown, which resembles a rook — an important chessman. 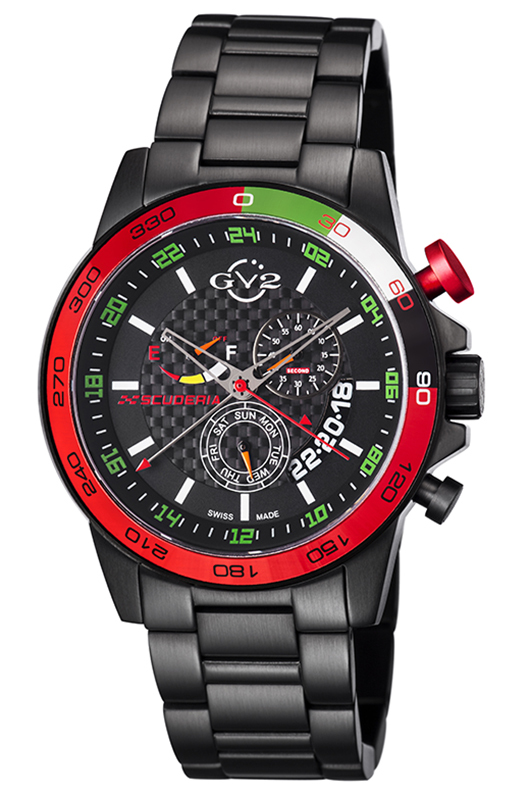 The current GV2 Tavolato collection contains six versions: three with a black-and-white checkered chessboard dial, and three more with a solid black dial. Both dials are available in one of three cases: stainless steel case with black IP bezel, black IP case and bezel, and rose gold IP case with black IP bezel. 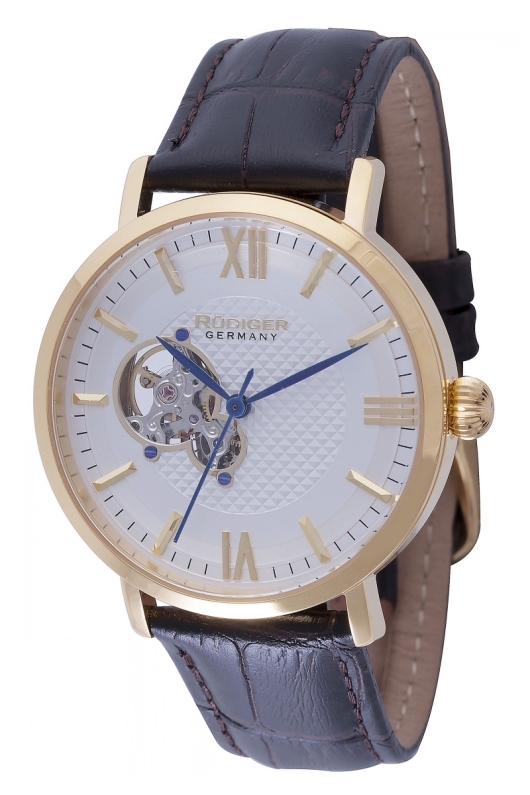 The design of the bezel features checkered squares cast at contrasting angles. Tavolato checkered dials resemble a chessboard from a bird’s-eye view. In addition to the board, the design features a red king’s crown at 12 o’clock, a red queen’s crown at 6 o’clock, red knights (represented by horse heads as they do in the game) at 2 and 9 o’clock, and white pawns at the remaining hours. 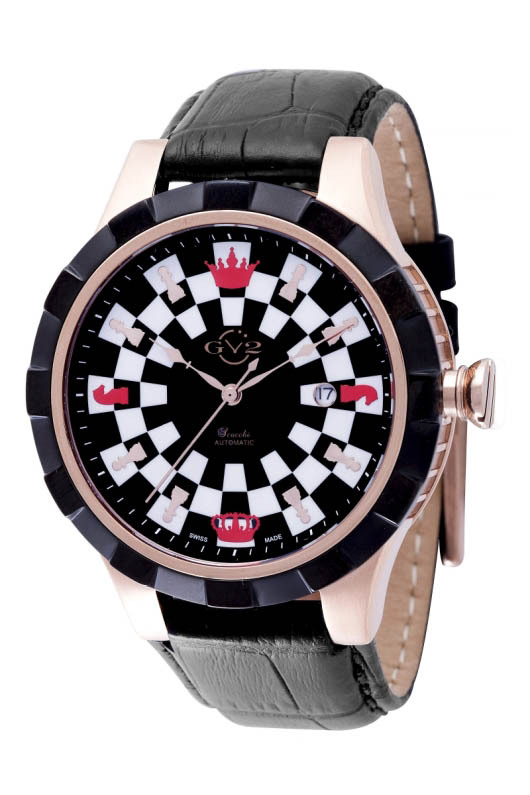 The hour and minute hands are also shaped like chess pieces, probably bishops, although they could also be variants of the king or queen since chessmen have numerous forms from one set to another. Variants with the solid black dial retain the red crown at 12 o’clock, but use Roman numerals as hour markers instead of chessmen to create a more traditional look and feel. The date function at 3 o’clock is mutual to every Tavolato model. Every GV2 Tavolato watch contains a Swiss made self-winding movement, a sapphire crystal with anti-reflective coating and a black leather calfskin strap, which pairs well with the watch’s black bezel. Tavolato watches are water resistant to a maximum of 165 feet and each variant is a limited edition. Chess is the game of kings. Some enjoy it quietly between friends; others play competitively at the international tournament level. 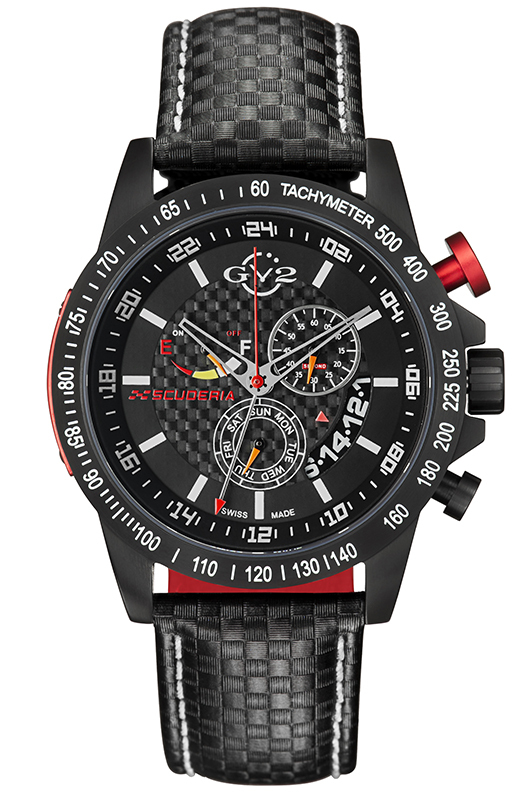 The Tavolato watch by GV2 is appropriate in either scenario and versatile far beyond. Whether it’s to express a general interest and strike up a conversation, or simply to delight in the game’s regal sensibilities on a daily basis, consider the GV2 Tavolato as the next addition to your watch collection. 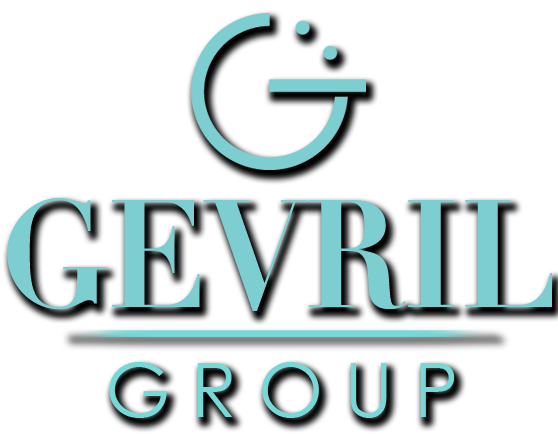 Contact an authorized GV2 dealer to find out more. Italians know that a Scuderia is not an ordinary stable. Watch aficionados know that it’s not an ordinary watch. In Italian, the word Scuderia refers to a stable reserved for racehorses. That’s why Italian drivers and racing teams adopted the word as their own to describe their country’s top motor racing teams. 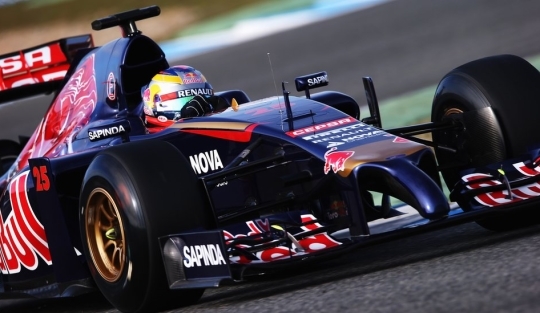 Today, there are dozens of Italian “Scuderia” teams, including some of the world’s most successful Formula One teams and drivers. When GV2 decided to develop their own version of the quintessential drivers watch, they adopted the Scuderia name in honor of Italy’s proud racing heritage. 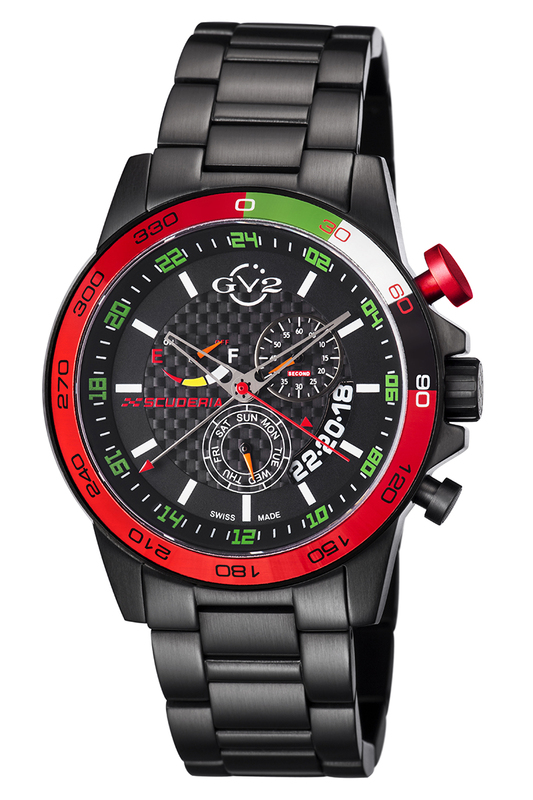 The boldly styled GV2 Scuderia has everything today’s racing driver needs. The oversize 50 mm IP black case features a racing style dial that is easy to read at a glance while behind the wheel. The large, color coded chronometer pushers can be used even while wearing driving gloves. 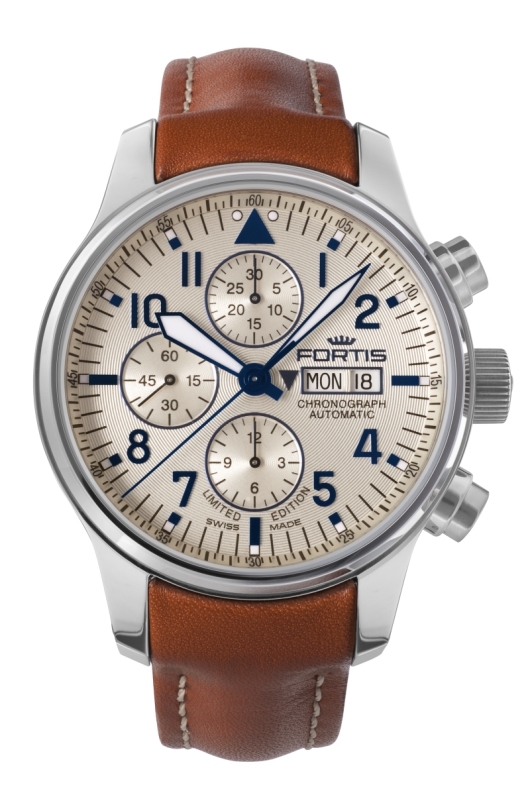 In addition to its easy-to-use chronometer functions and a handy tachymeter scale on the bezel, this full-featured driver’s timepiece also includes a power reserve, an alarm, a second time zone hand, a day of the week indicator, and an extra large big date indicator. 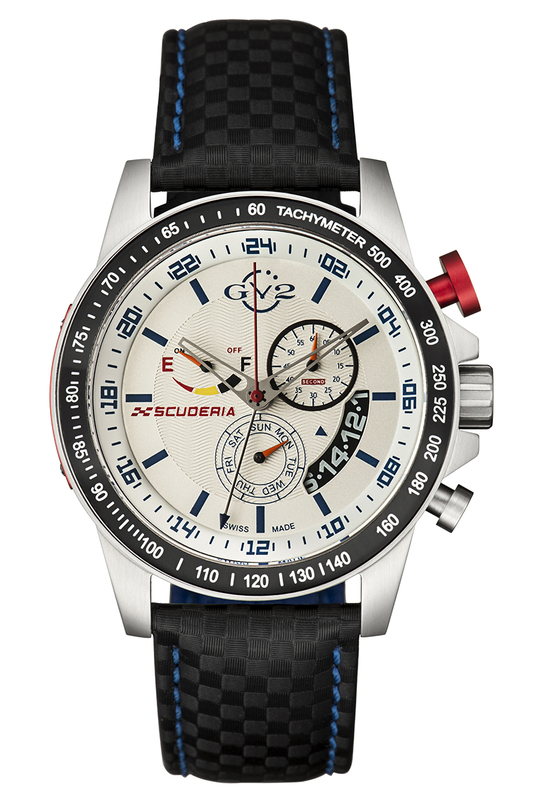 The impressive Scuderia is powered by a reliable and trouble-free Swiss made ISA 8173 Quartz movement and is water resistant to 330 feet. 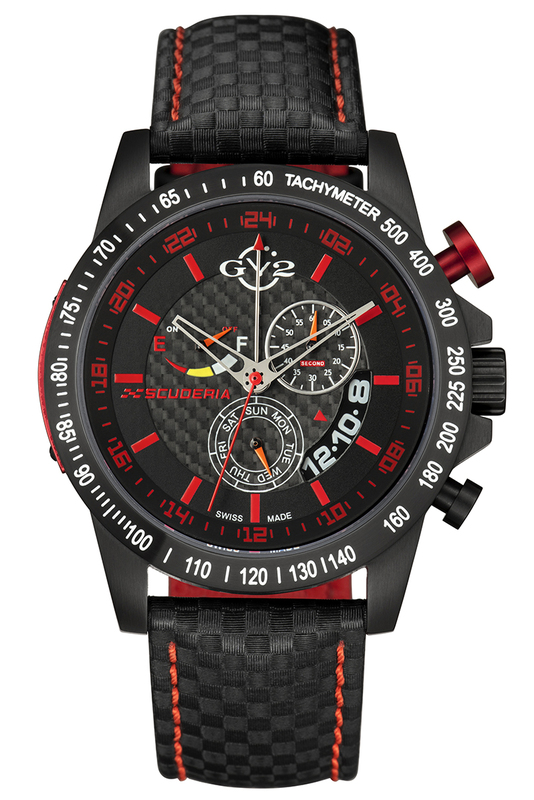 A black, carbon fiber style dial has been paired with brightly colored hands and numbers, along with a matching genuine calfskin carbon fiber patterned band to enhance the racing appearance. Timepieces in the GV2 Scuderia Collection are available with your choice of white, red, orange, or yellow markings on the dial, and are fitted with a matching premium top stitched leather band with a red, yellow, or orange lining. Even the oversized chronometer pusher flanking the protected setting crown is bright red for an unmistakable appearance. 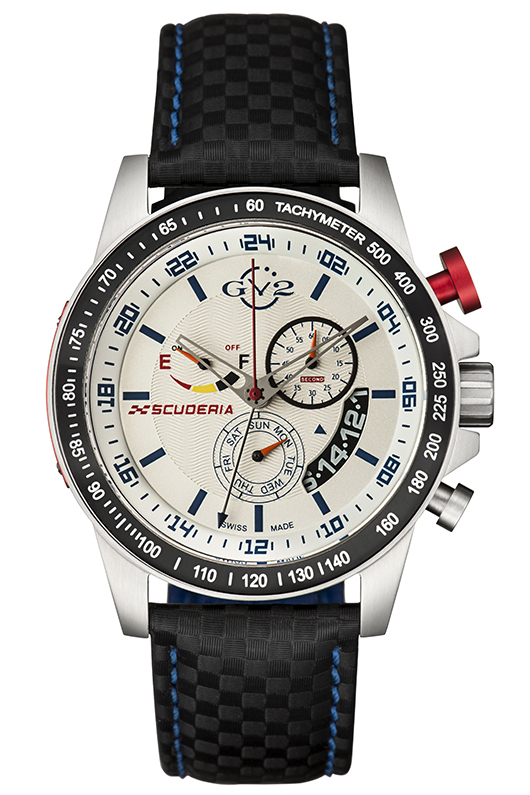 Like all GV2 timepieces, the dynamic looking Scuderia is surprisingly affordable. 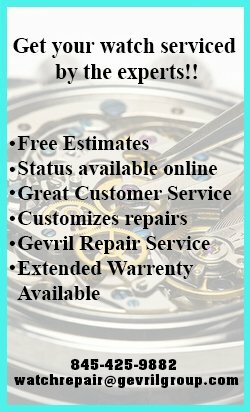 This professional driver’s timepiece combines all the features that drivers need at a price that is thousands less than some competitive brands, and it is backed by a 2-year manufacturer’s warranty. 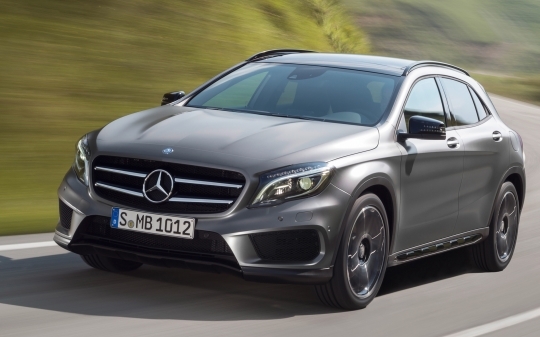 If you have a need for speed, you can start by putting something racy on your wrist. All you need to do to acquire your own GV2 Scuderia is contact your authorized GV2 dealer and ask to see the GV2 Scuderia Collection. The GV2 Scuderia includes a tachymeter scale, an alarm, a power reserve, an additional time zone hand, a day of the week subdial, and a date indicator. Figuring out how to use all these splendid watch complications could get… complicated. Look through our informative GV2 Scuderia instruction manual below, and learn how to control all of the Scuderia’s unique functions! 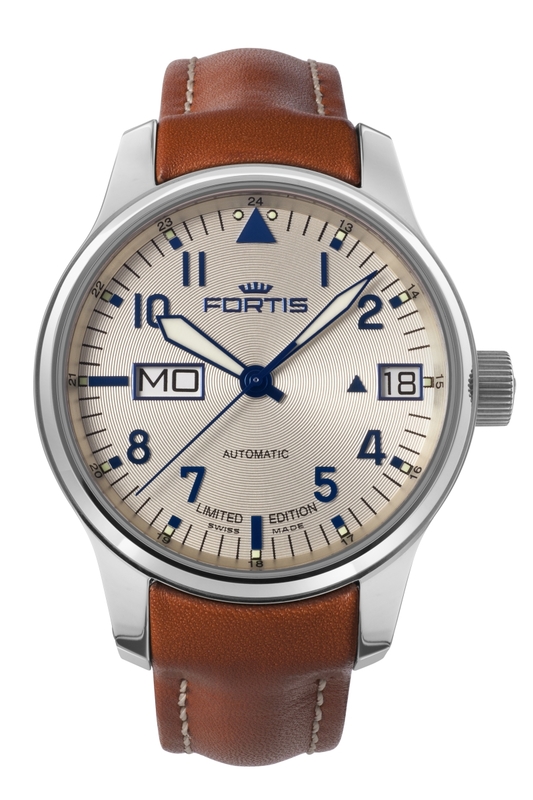 0.1 – Pull the setting crown at 3 o’clock to the third position and rotate either direction until the correct time is indicated on the silver timekeeping hands. 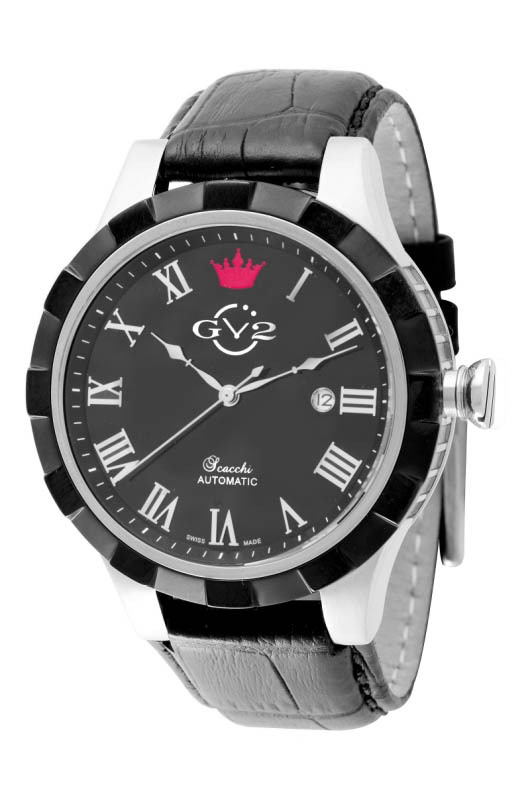 0.2 – When the time has been set, press crown all the way in again. 1.1 – Pull the setting crown to the third position and rotate counter-clockwise at least two full cycles until the correct day is indicated on the day sub-dial at 6 o’clock. The dial increments one day every 24-hours, so make sure you are aware if the current time is AM or PM. 1.2 – When the correct day is indicated, press the setting crown all the way in. 2.1 – Pull the setting crown to the second position and rotate clockwise until the correct date is indicated on the date wheel. You should make this adjustment in the morning, so the date will not increment at noon. 4.1 – Press and hold the lower black pusher for two seconds to enter the time setting mode. 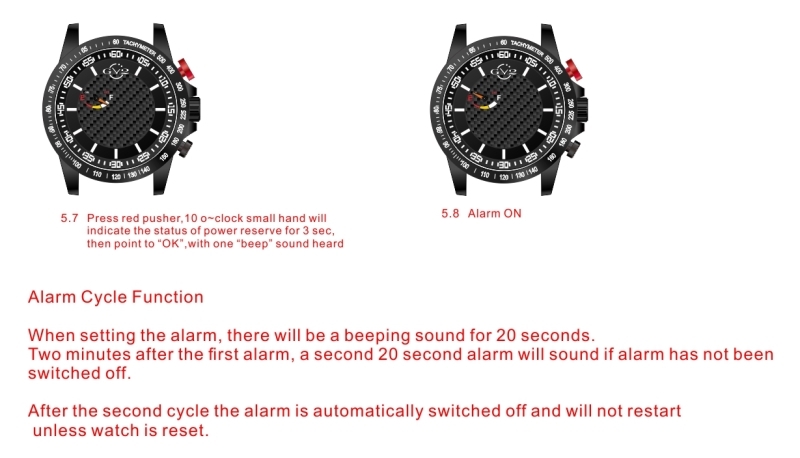 You will hear a short beep when it is OK to set the red tipped second time zone hand. 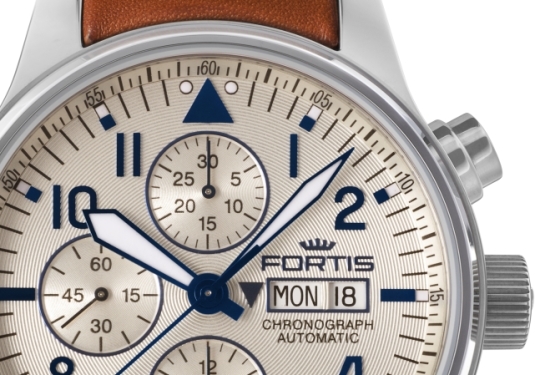 5.2 – Press the top red pusher until the small orange dial at 10 o’clock points to “E” on the Power Reserve indicator. 5.3 – When you are finished, press the setting crown all the way in again. The alarm function is on at this point. If you want the alarm to be off, press the red pusher again until the small orange dial returns to the off position. 5.5 – Pull the setting crown to the second position and rotate counter-clockwise until the red-tipped alarm hand is at the desired position. 5.6 – Press the setting crown all the way in again. 5.7 – Press the red pusher again. 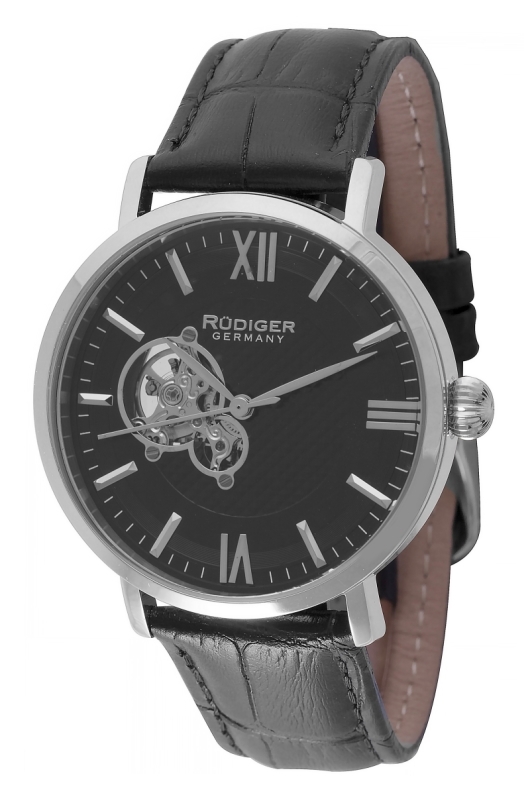 The small dial at 10 o’clock will first show the status of the power reserve for three seconds and then point to the “On” position to indicate the alarm function is active. 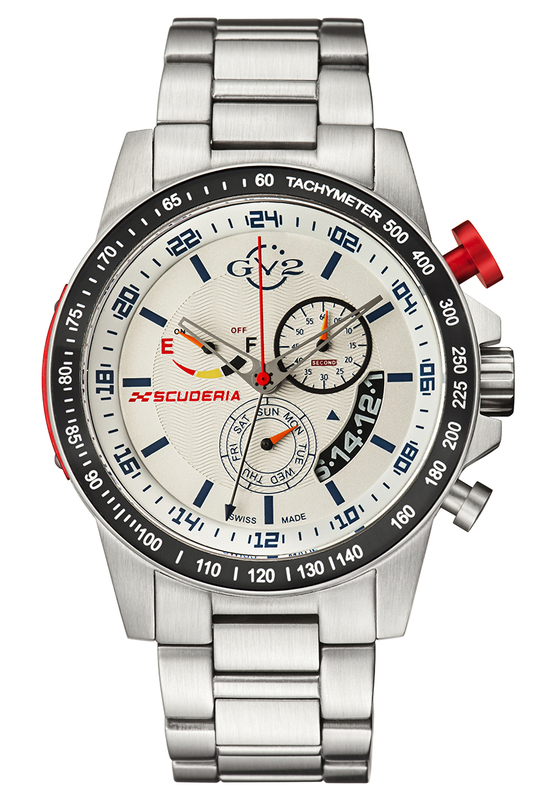 5.8 – The alarm is active until red pusher is pressed again and the power reserve dial returns to the “Off” position. The alarm can easily be turned on and off as desired by pressing the red pusher. 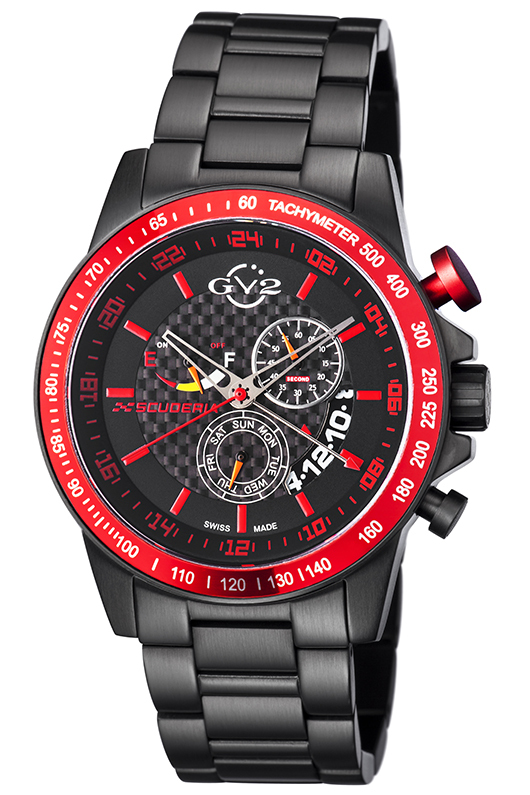 You can also download the GV2 Scuderia instructions as a PDF file here.